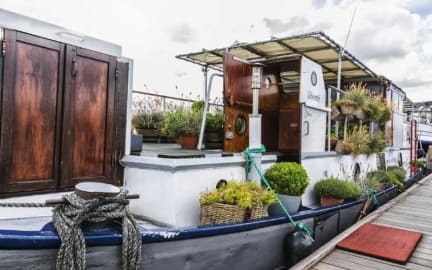 The Liberte Amsterdam is a lovely and intimate boat hostel, which recently celebrated its 100 year anniversary! We are floating on the quiet waters of Oosterdok pier, offering tranquility yet super central. From our home you can enjoy the sun setting behind Nicholas Church and mirroring on the canals. It goes that many happy sailing couples sailed the seas from here. We offer free WiFi, free Dutch traditional sweets, marshmallows and stroopwafels (typical Dutch cookies) all day long and a free and amazingly rich buffet breakfast which will allow you to kill your hard earned hangovers or get yourself ready for the day ahead! If you want to live a typically Dutch experience, nothing's better than boat life to frame your holiday in Amsterdam: let the Liberte charm you with its charming atmosphere. 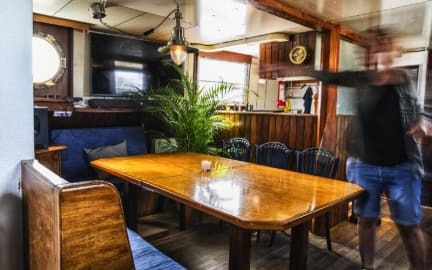 The boat interiors are designed to be typical, rustic but yet dark wooden tables, walls and furniture both in the kitchen and in the rooms, benches covered with soft blue couches in the common area, fresh flowers and good music all played from Apple TV ready for you to be chosen! If the weather is good, you can enjoy a drink sitting at the outside table on the deck, which at night is enlightened with colorful fairy lights. What we are famous for is our free, insanely rich buffet breakfast: offering different kinds of ham, salami, many sorts of cheese, bread, muesli, fruit, typical Dutch cookies, ginger cake and lemon cake, jam, peanut butter, chocolate spread, juice, milk, coffee, tea... and much more! The Liberte Amsterdam is located in Oosterdok, right next to the Nemo Museum and the Naval Museum and only 10 minutes on foot from the Central Station, the Red Light District and the City Center. If you arrive at the airport, take a sprinter train to the Central Station, or if you get at the Bus Station, you can get either the sprinter or an intercity train to the Central Station. Once you're there, just get out from the station, turn left and and keep walking in Oosterdokskade. At the end of the street, walk past the bridge towards the Nemo Museum, then turn right: the Liberte is on pier 2.